I will find out tomorrow. I've been toying with the idea of buying coloured jeans now for a while. Unfortunately they all come in the skinny variety which I find rather unflattering particularly as I am bending down to clear up some sick or other fluid. As an avid K-Middy fan, I was amazed to see her fabulous self in a pair of coral jeans. Surely coloured jeans are for those with no bottom? Having said that, from this picture it is clear to see that K-Middy is pure muscle. I will never look that good. However, easily influenced by the media and anything to do with K-Middy, I am now on the search for a pair myself. I'm not sure coral would do anything for me, and might in fact clash with my hair, so I'm looking for another colour. For spring I favour either lilac or mint green (just thinking about what I already have in my wardrobe). I will only buy online at either Warehouse or Oasis when it comes to trousers as I know they put plenty of stretch in them (which I need, believe me). OR Warehouse ones at £40. Ultra skinny...it doesn't sound hopeful does it? Anyway, I've gone with the Warehouse ones simply because I had a discount code.They arrive tomorrow. I will report back with whether I can get my "not particularly big" (my husband's words) derriere into them tomorrow. Wish me luck! Just the words Ultra and skinny strike fear into my heart! I have been toying with the idea of getting some red skinny jeans for ages but I too was concerned they would not be very flattering. let me know how you get on! I will! I like the idea of red too, either faded red or deep red, Warehouse have both. I suppose in theory if these Warehouse ones look ok, I can get some more in another colour!! I prefer skinny jeans, I have a black and blue pair but I do love the mint colour, I would wear black every day, must get back into colour! My husband says I remind him of K-Middy when I was her age, wish I still was her age! I have a blue pair but I must admit I'm glad to get rid of them at the end of the day, akin to an uncomfortable pair of contact lenses! I've been thinking about going for a coloured pair too but the very 'will be they make my thighs look enormous?' question has stopped me. Will be interested to hear your verdict! They were supposed to come today but they didn't come! I am gutted, I suppose it's because of the bank hol. Now I'm thinking they won't even come for Tuesday which is annoying as I need them for Tuesday night (if they fit that is). I might just bite the bullet and go and buy some full price on Monday. I will let you know about the sizing though! Im a size 16 (5ft6) any i have to say I looooove my skinny jeans, they look awesome (on and off)but im a bit dubious about the minty colour above..... as much as its a lovely colour, it not flattering on ones wider parts. Coral is a lovely warm colour, and one variation or another of it suits most people..... generally though a deeper or darker colour is best for skinnies if your worried about looking large. I love that my Dotty P Super skinnies cover a multitude of sins :D and are useful both as a uniform (for cleaning toilets and mopping sick) and on a night out with a top, tunic or lil dress. You are right about the minty colour. I went into Warehouse today (this might seem mad as I ordered them online but I had 25% off online only!) and was a bit gutted as the minty ones were much paler than they look on the website and I'm not sure I actually like them. There was a much nicer dark red pair, I might swap them. I will take a look. I saw a lovely bird print dress in DPs today. The sizes there seem a bit more generous! A bit cheaper than warehouse and oasis too. oooh I haven't seen those ones...I saw some orangey ones in the Warehouse sale today. I nearly bought but then persuaded myself to wait for the mint ones. 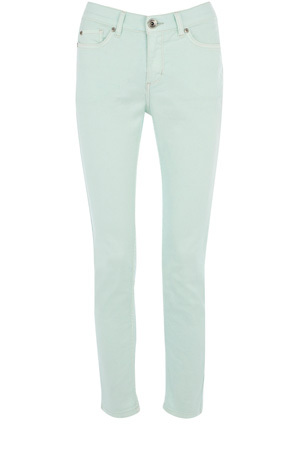 I too am loving the coloured jeans trend but find it very annoying that they only come in the skinny style. fashion just doesnt cater for busy mums does it?! The warehouse ones look beautiful, but they would be too 'young' for me: I got a cheapy pair that are not skin tight from Teaco! They're dull purple and go with all the other sludgy colours I wear and I'm really happy with them. Oh and I'm a size 14!